Corn, beans, salsa and melted cheese all rolled up in a crispy-coated chicken bundle - these impressive "burritos" are easier to make than you might think. 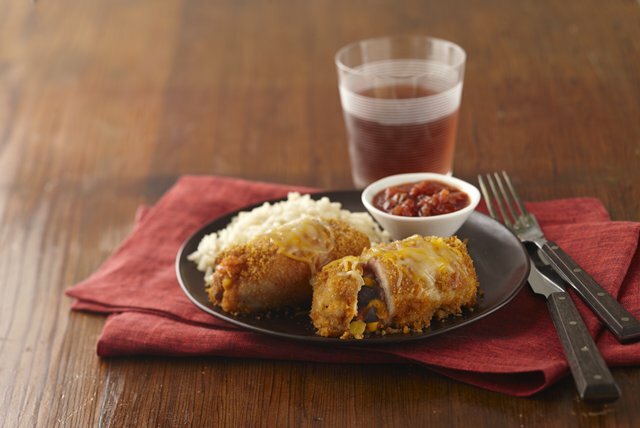 All the taste of Mexican burritos, in a baked chicken entrée - yum! Cover baking sheet with foil; spray with cooking spray. Combine corn, beans, salsa and 1/2 cup cheese. Place chicken, top-sides down, on work surface; top with corn mixture. Roll up tightly, starting at one short end of each. Place coating mix in shallow dish. Add chicken; turn to evenly coat all sides. Place, seam-sides down, on prepared baking sheet. Bake 25 to 30 min. or until chicken is done (170ºF). Sprinkle with remaining cheese; bake 2 min. or until melted. Refrigerate leftover canned beans. Use in soup, stew, chili or a quick tossed salad. Serve with hot cooked rice and additional salsa on the side.